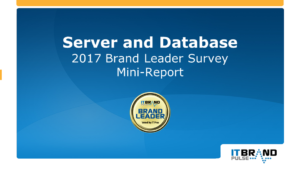 SAN DIEGO, CA—March 16, 2017—IT Brand Pulse, a trusted source for research, data and analysis about data center infrastructure, today announced the results of the recent IT brand leader survey covering Server and Database products. In a mirror image of last year’s results, Dell EMC secured all six leader titles for Enterprise Rackmount Servers (Market, Price, Performance, Reliability, Service & Support, and Innovation), once again leaving HPE as the overall runner-up, and Cisco in third. As one of only two vendors in this 2017 brand survey to accomplish sweeps, Dell EMC captured its second consecutive set of Market, Price, Performance, Reliability, Service & Support, and Innovation awards in White Box Servers, ahead of Supermicro and HPE, respectively. HPE remains the Enterprise Blade Server Market Leader—for the seventh time—in the minds of IT professionals. Respondents also chose HPE as 2017 Performance, Reliability, and Innovation leader. Though Dell EMC garnered both Price and Service & Support, Cisco edged them out to take second place Market Leader. HPE’s Moonshot earned its third straight Market Leader achievement, along with Performance, Reliability, Service & Support, and Innovation. Supermicro, number two all-around in front of Quanta, disrupted the category lock by collecting Price Leader. For 2017, Microsoft again pulled in a pair of Market Leader wins for both Server OS (fifth time) and Cluster OS (second year). While the IT pro community also cast their ballots for Microsoft Windows as the Performance and Service & Support Leader in Enterprise Server OS, they split up the brand awards for this category by handing Price, Reliability, and Innovation to Red Hat’s Linux (the Market runner-up; Oracle Solaris was third). 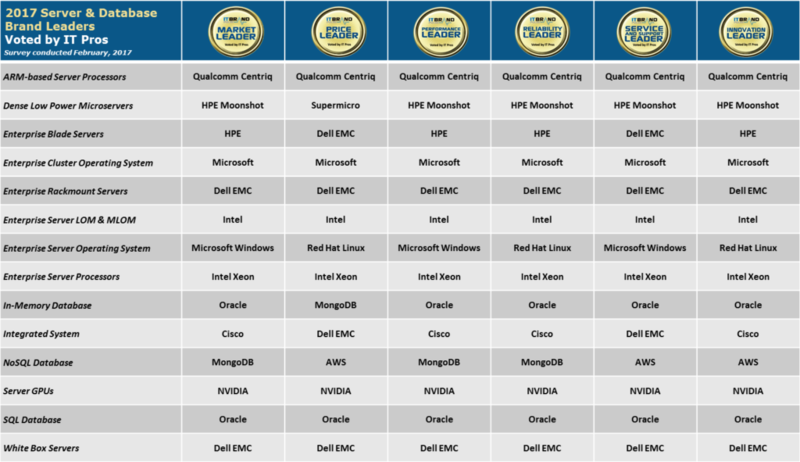 Microsoft grabbed all available leadership awards for Enterprise Cluster OS: Market, Price, Performance, Reliability, Service & Support, and Innovation; and as with Server OS, Red Hat filled in the overall second slot, preceding Oracle. NVIDIA outpaced its rivals for the Market, Price, Performance, Reliability, Service & Support and Innovation leadership in Server GPUs, a newly-added survey category. Intel and AMD placed second and third as Market Leaders, accordingly. Interrupting Oracle’s attempt at a triple database leader championship in this survey, IT pro voters instead picked MongoDB as Market, Performance, and Reliability leader for NoSQL Database. Last year’s winner, AWS, took home the Price, Service & Support, and Innovation titles and was the second choice for Market Leader, in front of Microsoft. With three database products represented in this survey, Oracle duplicated last year’s outcome and prevailed in two. For In-Memory Database, Oracle received Market, Performance, Reliability, Service & Support and Innovation titles. Though Microsoft came in as the number two Market Leader, third-place MongoDB emerged on top of the Price chart to upset an Oracle potential sweep. Oracle clinched SQL Database Market Leader for the fourth time, in addition to reaping all remaining titles of Price, Performance, Reliability, Service & Support and Innovation. Microsoft stayed ahead of AWS in the Market Leader results, to close out second. Intel repeated 2016’s 80% vote share in Enterprise Server Processors to be chosen Market Leader for the sixth year in a row. Intel Xeon also picked up Price, Performance, Reliability, Service & Support, and Innovation. Like last time, IBM Power and AMD Opteron, followed from a distance in the second and third positions, accordingly. In a less-lopsided victory than in the Server Processor category, Intel was selected as Enterprise Server LOM & MLOM Market Leader (fourth straight year), as well as Price, Performance, Reliability, Service & Support, and Innovation champ. Next, in the Market Leader line, were Broadcom and Mellanox, in that order. From a group loaded with 16 vendor choices, respondents to the Integrated System survey copied 2016 and tapped Cisco for yet another year as Market, Performance, Reliability, and Innovation leader. Dell EMC was singled-out for Price and Service & Support honors, and rounded out the number two Market position, with Nutanix in third. ARM-based Server Processor was yet another new product category mixed into the hundreds of IT Brand Pulse leader surveys, and this one saw Qualcomm seize nearly 70% of the Market Leader voting. Qualcomm Centriq—which was also the preference for Price, Performance, Reliability, Service & Support and Innovation—kept the Market lead ahead of Marvell Armada and Cavium ThunderX, the number two and three finishers.